We know a new haircut on the first day of school can help a child feel more confident and can make a big difference to start the next academic year. 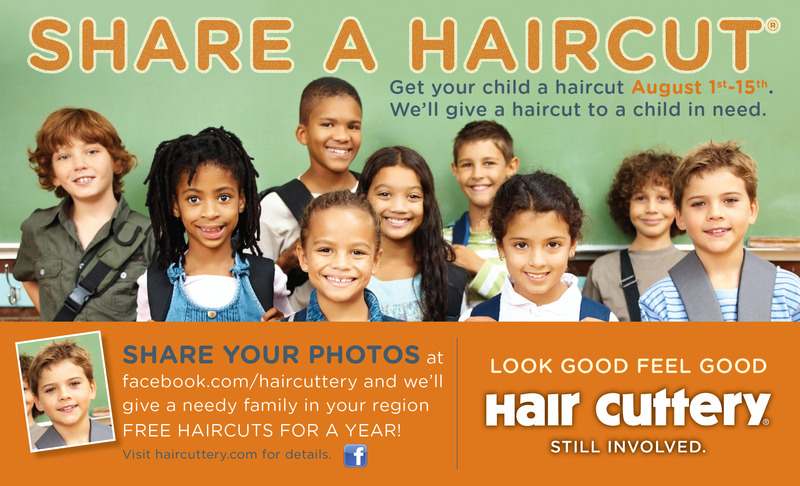 Hair Cuttery, the largest family-owned and operated chain of hair salons in the country, will launch its eleventh annual Share a Haircut program to provide children in need a fresh haircut to start the new school year. “We know a new haircut on the first day of school can help a child feel more confident and can make a big difference to start the next academic year,” said Dennis Ratner, Founder and CEO of Hair Cuttery. From August 1st through 15th, every time a child (aged 18 years old or younger) receives a haircut at any of the nearly 900 Hair Cuttery salons, a free haircut will be provided to a disadvantaged child in the community. Through partnerships with over one hundred local social service agencies and non-profit organizations, Hair Cuttery has donated more than 500,000 haircuts since the program’s inception in 1999. Hair Cuttery has an established legacy of charitable giving. The company supports a number of national and local causes, including: Dress for Success, American Cancer Society, Special Olympics, Buzzing 4 Change, National Kidney Foundation, Susan G. Komen for the Cure and Locks of Love.